Table located on the Dance Floor. One Liter Bottle of Premium Liquor. Table located in the Lounge Area. #ReplaySundays: Relax and chill with all your friends while mingling with Industry People, NFL players, Athletes & Cheerleaders at this NEW venue! Everyone says there's nothing to do Sunday Nights - now there is! 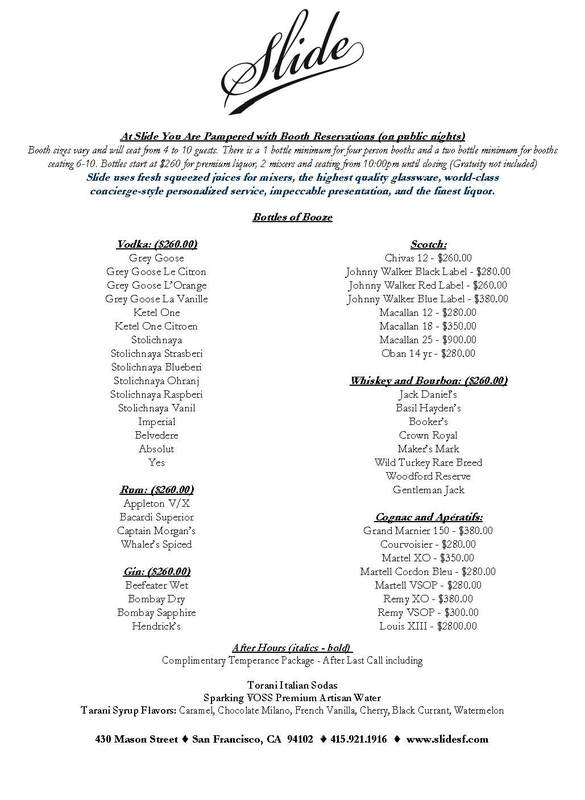 This is also an Industry Night for Salons, Life Style Boutiques, Hotels, Restaurants, Bars and Night Clubs! This is the Sunday Night Industry Standard and the Only Place to Be! Come see what all the buzz is about! 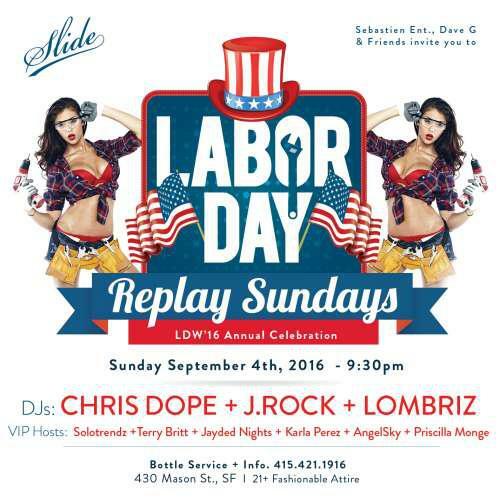 #SlideSF: is modern and sophisticated but is also reminiscent of the age of gangsters, flappers and bootleg revelry of years past. Outfitted in over 8,000 square feet of mahogany, Slide features a honey-onyx backlit bar, custom brown and blue hardwood floors, pillowed porcelain bathroom walls and copper accents. Booth seating in chocolate brown and baby blue are available for Bottle Service. Slide is in a class all by itself with its beauty, history and innovative menu choices as well as our careful attention to every detail. Ideally situated in Downtown San Francisco in the historic Theater District, adjacent to Union Square.